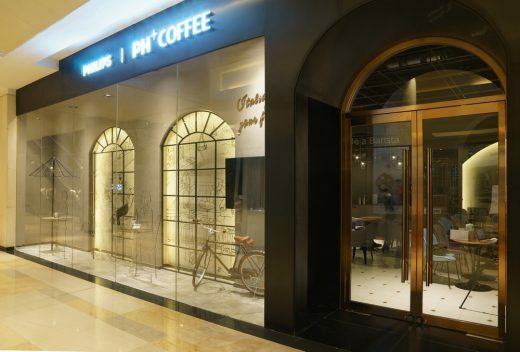 From electronics to coffee, from tradition to technology, from west to east, as one of the largest electronic brands in the world, PHILIPS, through such a carrier as traditional Italian coffee, integrates its own technological advantages and cooperates with GB Space in building the first cross-industry intelligent coffee shop in China. 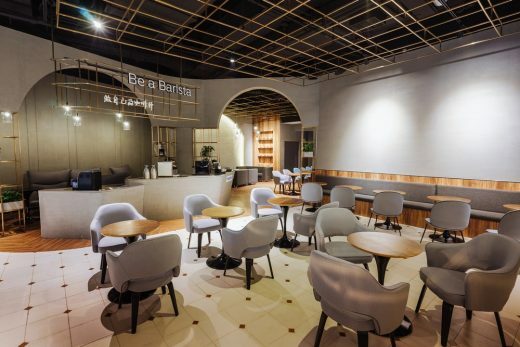 The challenge of this project is how to enhance the public’s recognition on the new brand image through interior design. 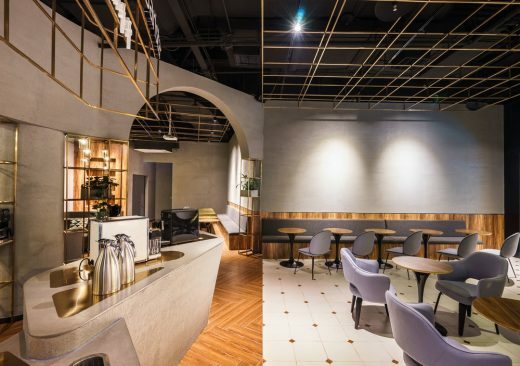 PH COFFEE is located at Beijing Financial Street, a gathering place of numerous financial institutes and enterprise headquarters, covering consumer groups varying from white collars to students. The 170 m2 space mainly consists of the front desk area, exhibition area and private area. “PH COFFEE stands for pure Italian coffee. 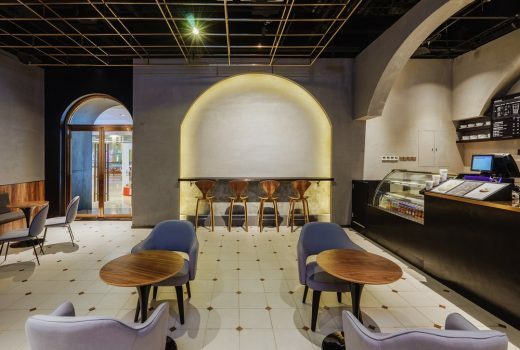 We associate Italy with many representative ancient Roman architectures.” Drawing inspiration from Italian coffee,　GB Space starts from arch elements of ancient Roman architectures, and hope to make guests feel European fascination in the space through the restoration of lines. Based on the same design idea, metal lattice ceiling is the simplified ceiling of church during the Renaissance. 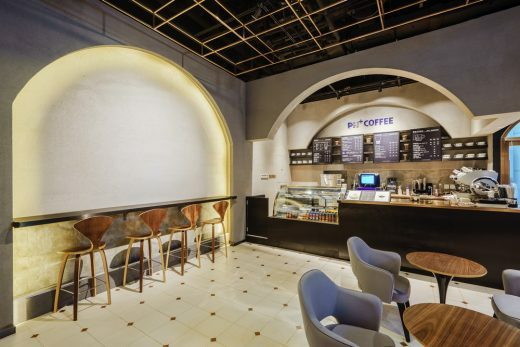 The selection of these two elements indulges guests into Italian coffee atmosphere. 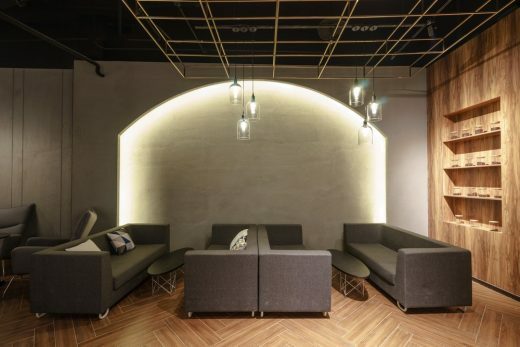 In this case, arch elements run from exterior building through the whole interior space. 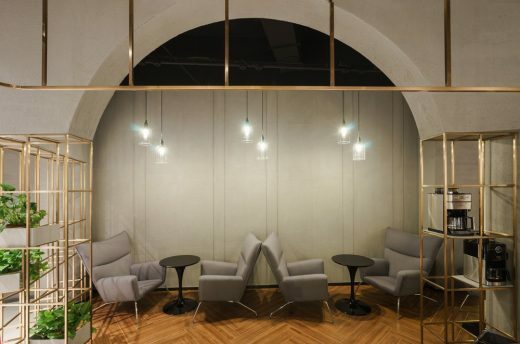 Through the design of arched “doors” one by one, it clearly divides each indoor and outdoor functional area. 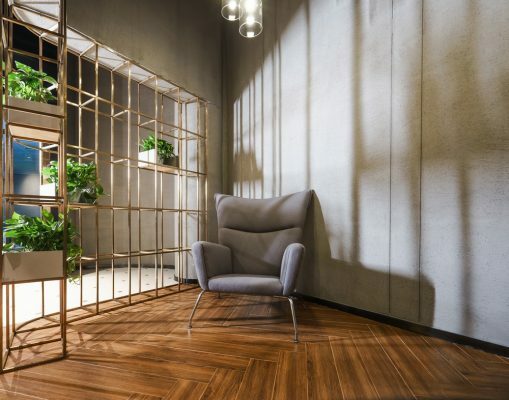 The entrance window area and arched glass door firstly set the Italian culture image, and the organization of interior space relies on arched doors, combines with curved ground materials, and defines three functional areas. The front desk area takes bar counter as the focal point, with simple tables and chairs arranged in line with the overall indoor color tone; the interactive exhibition area is in the center of space, creatively combining the two different types of functional space — exhibition space and coffee shop; while the private sofa area creates a private coffee moment, accommodating both the vintage and modern features in soft decoration. To emphasis the idea of “contrast” between the past and modern times, GB Space played with materials instead. 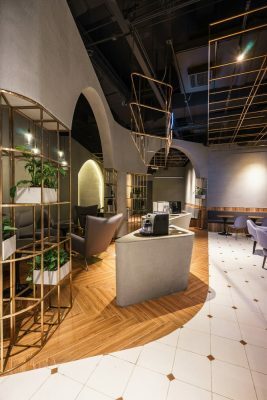 The contrast of rough arch vault with the exquisite metal suspended ceiling expresses the design concept of transforming from tradition to modern times. 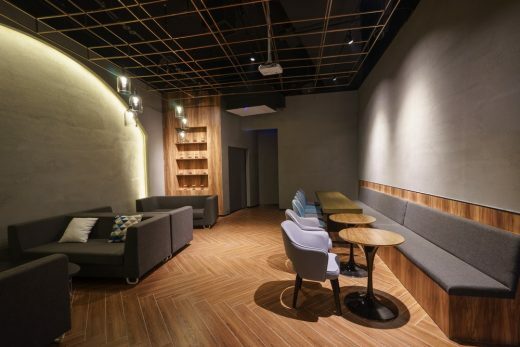 Coarse white ground tiles come to contrast with warm wood floor, meanwhile, small wooden checks inlaid therein highlight the design details, and the interwoven and interconnected method of ground materials makes the space transition more natural and outstanding. 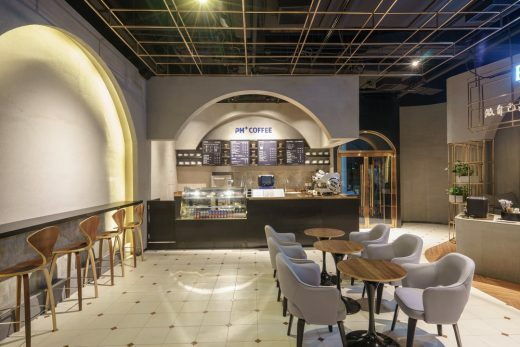 The most challenging part of this project is how to enhance the public recognition on the brand of “PH COFFEE” through interior design, bringing alternative experience for guests. 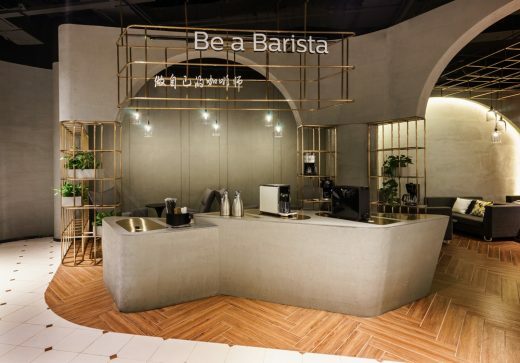 Therefore, GB Space designed an interactive exhibition area in the center of the space, linking with traditional Italian coffee with technology innovation. 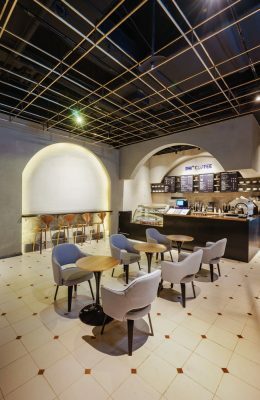 The advantageous position gives full play to the uniqueness of this “free space” and integrates itself to the overall environment of coffee shop. PHILIPS fully automatic coffeemaker on the operation table is provided for guests to make coffee by themselves, making them feel the charm of modern intelligent technology as well as the unconstraint and casualness of European culture.